Former UFC featherweight kingpin Jose Aldo is looking to score a rematch with Conor McGregor. The Brazilians callout comes on the heels of the Irishman’s fourth-round submission loss to Khabib Nurmagomedov at UFC 229. Não tem pra onde correr! Jose Aldo and Conor McGregor first met back at UFC 194 in December of 2015. Aldo entered that contest, which at the time was for his UFC featherweight title, riding a sensational eighteen-fight win streak. 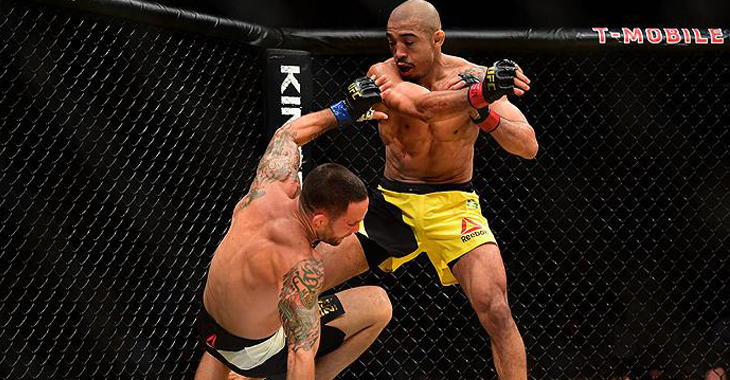 However, Aldo’s incredible streak came to a shocking end just thirteen seconds in to the fights opening round. McGregor was able to land a picture perfect left hand that sent the mixed martial arts legend crashing to the canvas. Aldo has always wanted a chance at redemption against McGregor and now might be as good of a time as any for this rematch to happen. Jose Aldo is coming off a first-round TKO victory over Jeremy Stephens which occurred this past July in Calgary. 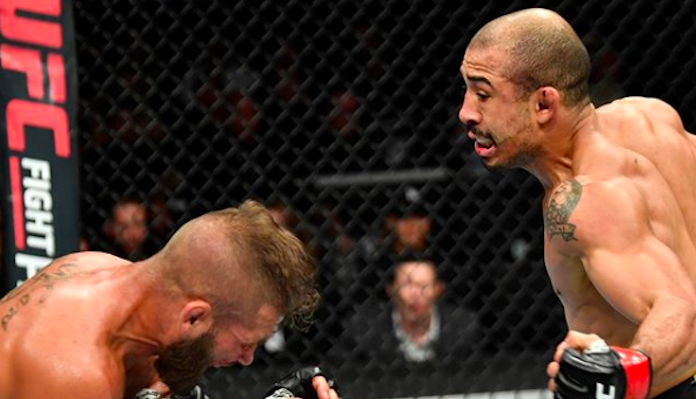 Following his first stoppage win in nearly five years, Aldo announced his intentions to move up in weight and join the promotions 155-pound ranks. Unfortunately for Aldo, Conor McGregor appears to have his sights set on an immediate rematch with current lightweight title holder Khabib Nurmagomedov. “Mystic Mac” has gone 9-2 under the UFC banner, with his only two setbacks coming at the hands of Nate Diaz and the aforementioned Nurmagomedov. 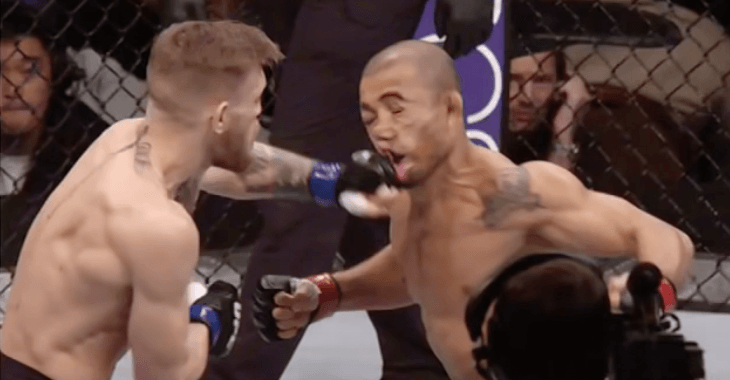 Would you like to see a rematch between Jose Aldo and Conor McGregor booked next by UFC officials? Former UFC featherweight champion Jose Aldo and perennial division contender Jeremy Stephens appear to be on a collision course for June’s UFC event in Singapore. Earlier this month, CanalCombat reported that Jose Aldo was offered and had accepted a bout with “Lil Heathen” for the June 17 fight card in Asia. While no official announcement has been made by the UFC, Jeremy Stephens definitely seems on board with the idea of fighting the former featherweight kingpin in Singapore. “Lil Heathen” sent out the following message to Jose Aldo and the UFC match-makers on Twitter. Vacation is officially over, the fans want it @josealdojunior I'll see you in Singapore @ufc @danawhite @seanshelby get ready!! Jose Aldo was last seen in action at December’s UFC 218 event in Detroit where he suffered a second-straight third-round TKO loss to Max Holloway, this time in his bid to recapture the UFC featherweight title. Prior to his setbacks to the Hawaiian champion, Aldo was coming off an impressive victory over former lightweight champion Frankie Edgar at UFC 200. Meanwhile, Jeremy Stephens is currently riding an impressive three-fight win streak composed of a vicious knockout of Josh Emmett, a thudding TKO of Doo Ho Choi, and a decision defeat of Gilbert Melendez. Who do you think will emerge victorious if the UFC makes a fight between Jose Aldo and Jeremy Stephens official to main event June’s UFC event in Singapore? UFC featherweight champion Max Holloway gets a new opponent and will still be defending his title at UFC 218 on December 2 in Detroit, Michigan. The news was reported by MMAFighting’s Ariel Helwani. Holloway was originally slated to make his first title defense against former lightweight title holder Frankie Edgar at the event. However, “The Answer” was forced to pull out of the contest Wednesday afternoon due to injury. Shortly after the news that Frankie Edgar had been forced off of the December 2 fight card, Max Holloway took to social media where he stated his intention to remain on the Detroit fight card. The Hawaiian champion, Holloway, was most recently seen in action at June’s UFC 212 event in Brazil, where he earned a third-round TKO victory over Jose Aldo to become the UFC’s undisputed featherweight champion of the world. As for Holloway’s newly announced opponent, Jose Aldo and Holloway last fought at UFC 212 where the Hawaiian successfully unified the UFC featherweight titles. Now, his first defense of the unified belt will be against the former king of the division himself. Who do you think will win when Max Holloway and Jose Aldo square off on December 2 in Detroit? Sound of PENN Nation! The Denver Broncos have released veteran safety T.J. Ward according to the NFL Network’s Ian Rapoport. Ward was set to make a non-guaranteed $4.5 million this upcoming NFL season. The two-time Pro Bowl safety recorded three interceptions and five forced fumbles during his 41 games with the Broncos. The 30-year-old, Ward, will likely find a new home before the start of the 2017-2018 season, as teams have already begun to express interest. Be sure to come watch all of this seasons NFL action live at one of Kauai’s Kalapaki Joe’s locations, the Westernmost Sports Bar in the U.S.A!